There have been two complaints about defective Chicago screws among buyers of the Triple-O knife and belt clip. Now, that’s less than a 1% failure rate so far, but it’s too many for my taste. I have changed suppliers and I have screws which are superior in every way–bigger, stronger, with slots on the post, made in North America (they tell me), and hopefully with a 0% defect rate. All new orders will ship with the new screws. 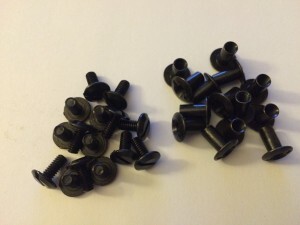 However, if you are having any trouble, or simply would like a nicer set of screws for no particular reason, hit the Contact Page and I will send you a pair. I apologize to those of you who had trouble with the old screws, and thank you to everyone who bought a Triple-O knife!